Courage and/or an iron fist are not “…what it takes…” to hold people accountable. Roaring like a lion and flashing a set of brass knuckles are more likely to produce acute anxiety than actual accountability. The good news: Confrontation doesn't necessarily lead to conflict, nor does conflict lead to negative confrontation. By definition, confrontation merely means to communicate face-to-face. Constructive confrontation is a structured, systematic approach that decreases conflict and increases accountability by connecting the dots between what people want and what organizations need. Constructive confrontation reduces conflict in the same way it increases accountability; through clear and well-articulated expectations, follow-up, and recognition. Increased accountability with less conflict requires consistent, constructive confrontation that establishes the course, makes course corrections, and reaffirms the course. Confrontation is misunderstood, avoided, and not applied as soon, or as often, as needed. When it is applied, it's usually an expression of frustration instead of skilled leadership. 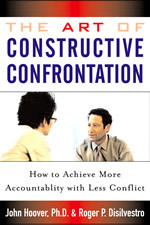 Constructive confrontation is not a practice reserved for leaders to apply to subordinates. Anyone, at any level, can, and should be encouraged to, engage in constructive confrontation. The conditions are simple: (1) There must be a covenant between the parties outlining expectations, methods, and measures. (2) All parties must confront one another to ensure progress and performance are what they should be. This means peer-to-peer confrontation as well as team member to team leader confrontation. The rules and principles are the same for everybody; the only difference being range of institutional responsibility. (3) All parties to the covenant must celebrate the successful completion of each designated step in the process. The process of securing true commitment is based on emotional purpose. Each team member must be able to clearly articulate his or her personal and professional ambitions in real and certain terms and how his or her current employment helps fulfill those ambitions. The supervisor, manager, or executive must also disclose his or her emotional purpose, and relate them to his or her role in the organization. The discussion of emotional purpose helps team members internalize the context of the job. Job functions are not typically tailored to suit what the individual wants and needs. But, aligning the team member's wants and needs as closely as possible to what the organization needs sets the stage for enthusiastic and productive performance. Without this piece of the commitment conversation, both team leader and team member might operate from assumptions that can sabotage a working agreement. In terms of job motivation, emotional fulfillment is every bit as important as money and prime real estate on which to park a car. The commitment stage of the process eliminates the mind-reading that so many supervisors, managers, and executives expect will fill in the gaps when their team members aren't adequately briefed. During the commitment stage, team leader and team member discuss specific goals, the schedule for reaching the goals, and the process for achievement. No much new in that. However, the commitment consists of more than ethereal goals that sound good in motivational meetings, or in the optimistic glow of goal setting sessions or change management seminars. Team member and team leader must commit to one another to fulfill their agreed-upon roles and responsibilities. One of the leader's responsibilities is confrontation. But, team leaders must be willing to be confronted by team members as well. If there is no clear, written, covenant between team leader and team member, there is no basis for confrontation by anyone, except by pulling rank. Formation of a covenant completes the first arc in a skilled leader's circle of confrontation. If expectations are created by one party without agreement from the other, if elements, the time table, process remain ambiguous; if the terms of the commitment are not recorded and communicated, there is no reason to expect compliance. Without a written roadmap of expectations for the performance of individual team members, there is no target to aim for, much less criteria for constructive confrontation. If the commitment to action isn't cleansed of all ambiguity, the entire agenda is likely to be derailed. Tasks and objectives must be specific, concrete components individual team members can complete in a measurable manner. And they must be written down. The circle of confrontation begins with each team member's commitment to the required actions, in real time, to achieve real results. The covenant between team member and team leader must be realistic, complete, and meaningful before it can be enforceable. Confrontation is course confirmation and, when needed, correction. In business and organizational life, as in many other aspects of human behavior, people set out to achieve predetermined goals and don't revisit the goal until it has been achieved, not achieved, or the effort is abandoned along the way. Any pilot or navigator knows that, although the aircraft of ship departs for a specific destination, course corrections en route are essential to reaching the destination. Rewriting or reaffirming goals and expectations. As progress and performance are regularly monitored and evaluated, the original goals might need to be re-evaluated. Internal or external changes to the organization might call for modification of the original goals. Other, unforeseen, influences might require adjustments. Communicating what might have not been initially expressed and/or understood. Thanks to a continuous refinement process of monitoring performance and progress, lack of adequate information or misunderstanding need not rear their ugly heads. Things can't be said once and expected to remain in the front of anyone's consciousness. Confrontation is reminding, reminding, and reminding again. Exposing intentional or unintentional misrepresentations. People can innocently commit to more than they're capable of delivering. They can also intentionally misrepresent what they're capable of delivering, figuring that no one will confront them on it later. Windows can open for conflict to creep in when team leader or team member intentionally misrepresents him- or herself during the commitment stage. Consistent constructive confrontation deals with this issue sooner rather than later, and provides everyone an opportunity to come clean before too many opportunities are lost and too much damage is done. Confrontation, based on the covenant team leader and team member agreed to, is constructive and non-threatening. It's not a personal attack, because there is nothing personal about progress or lack of progress on a pre-determined agenda. With a clear roadmap for progress, the discussion immediately focuses on whether the team member is on course or not. If not, the conversation can immediately segue into what is causing the disruption or disconnect, and how it can best be addressed. When little or no clarity exists about expectations, roles, and responsibilities, confrontation is almost always a negative and unproductive experience. The commitment stage must be fully completed before the confrontation stage can reach full value. Flexibility in course corrections or acquiring new information is always helpful. But, “changing the rules as we go” is never a confidence builder in team members' minds, and often results in cynicism. When supervisors, managers, and executives don't work the program, team members start bailing out. Celebration helps keep confrontation constructive. If the only ongoing dialogue a team leader offers a team member deals with course correction and compensating for shortcomings, the long-term effect will be dampening. Constant recognition of achievement, appropriate for the size of the accomplishment, helps perk up the confrontation conversation. Armed with recognition for the team members' successes, the team leader consistently and constructively confronts each team member as she or he guides the team member's personal and professional growth—all of which were included in the original covenant with an eye toward reaching and exceeding personal and organizational goals. When it works, however, many people are surprised and don't know what to do. For many, completely meeting a challenge is a new experience. It part of the team leader's responsibility to help team members learn to lighten up. Team leader and team member alike must become good at celebrating, and not discount it as frivolous or irresponsible behavior. Celebration is the consistent and continuous reinforcement of the little things and big things that make goal attainment possible; especially the little things. Celebration starts with the smallest achievements upon which the larger accomplishments are built. Just as monitoring progress and performance are essential elements of the process, recognizing successful completion of tasks and other process elements outlined in the commitment stage is also critical to successful completion of the circle of confrontation as a whole. Without celebration, commitment and confrontation are meaningless. But, what should be celebrated? The circle of confrontation is based in part on the achievement and acquisition of the things team members have identified as the possessions, moments, and memories they seek most in their lives. Life achievements outside the workplace need to be celebrated as much as milestones in the internal process. The act of celebrating is an excellent opportunity to reaffirm the connection between internal and external agendas, and how they compliment each other. If commitment and constructive confrontation result in successful completion of the covenant, celebration is essential to renew the cycle. The celebration component of the constructive confrontation process provides fuel for the continued effort. It marks the end of one cycle and beginning of another. From celebration comes increased confidence and renewed commitment as the cycle begins again. Each new cycle of success begins with a newly energized person as a result of how well the team leader facilitated the team member's growth and development throughout the process. The ultimate cycle is fulfilled when the team member is able to step up and lead another person through the process of commitment, confrontation, and celebration. That's cause for real celebration. If enterprise leadership lacks a spine about anything, it's the willingness to confront. A well-crafted covenant between team leaders and team members is only as good as the team leader's commitment to support each team member through consistent and constructive confrontation and celebration. To give executives, managers, and supervisors the benefit of the doubt, no one probably taught them how badly they are cheating themselves, their direct reports, and their organizations as a whole, when they fail to confront in a thoughtful, methodical, systematic, and strategic manner. Although confrontation, in the form of coaching, encouragement, and accountability is an essential tool in a team leader's skill set, the craft of constructive confrontation is so rare that few have seen enough of it to imitate. It's not taught in MBA programs. Typically, once goals and objectives are set in most organizations, many team members and team leaders look the other direction, aware at some level that there will be no follow through. If team leaders fail to confrontation constructively, team members not only have the opportunity to disconnect from their commitments, they have a person to blame—the leader. One of the core concepts supervisors, managers, and executives need to learn is that appropriate action drives right thinking, not the other way around. Training, education, hype, and/or fear-mongering won't produce high-performance over time. Even when eliminating hype, false promises, and fear-mongering and staying with positive practices like training and education, the active follow-through of constructive confrontation is still vital to genuine performance enhancement. Once the three-steps of constructive confrontation are understood, the necessary instruction and encouragement can be applied and measured evenly across the organization.